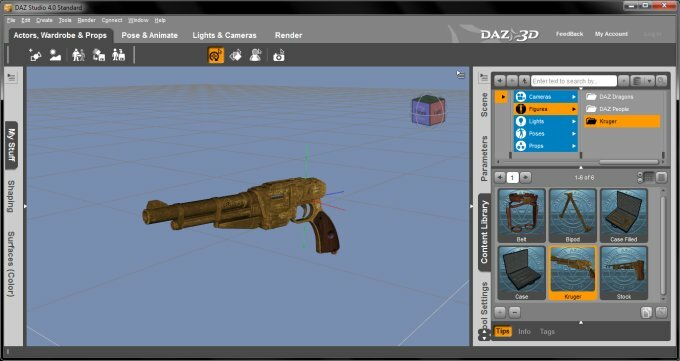 DAZ 3D Daz Studio 4 is another little 3D art gem you've probably never heard of, unless you're into modeling and rendering like myself. If so, this nifty little program shall definitely interest you. Or as the official motto reads, unleash the artist within. He or she may be small, but definitely fierce, the artist, that is. Ahem. DAZ Studio is specifically tailored to help you create 3D figure illustrations and animations, the kind of work you will probably struggle in most other programs like Google SketchUp or POV-Ray, unless you're extremely talented and skilled. As such, it seems like the perfect complement to more rigid, straight-line oriented software. Well, let's see what it can do. 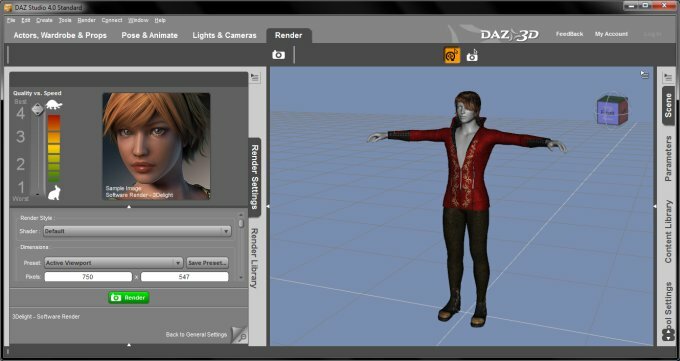 DAZ Studio currently runs on Windows and Mac OSX, so if you're a mostly Linux user, this program won't work for you just yet. But that's no reason to throw away good art. Anyhow, earlier, when I said nifty little program I meant 400MB worth of data, which is a sizable download. The program is free for personal use, but there's a sweet catch. 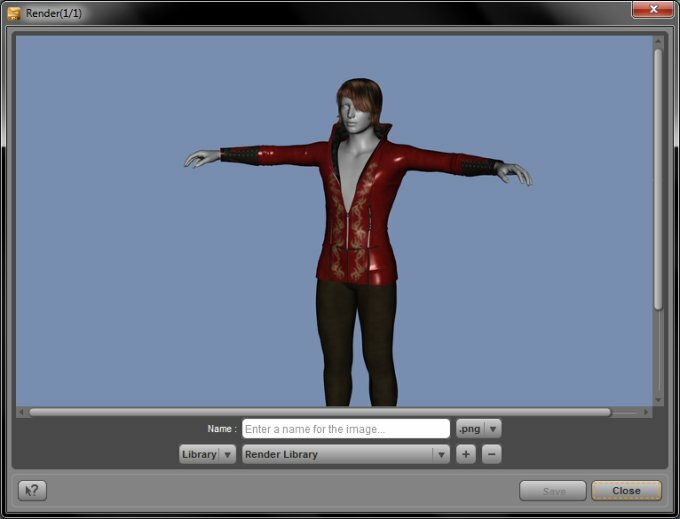 Once you load the program, you'll see a very simple, intuitive interface, which consists of ragdolls with realistic physics and bits of clothing, weapons, gear, and other implements you can add to your mannequins. The beautiful part is that you only need to focus on creating realistic sceneries, without having to create individual items. For artistically challenged people with no drawing skills but moderately decent spatial coordination, this is an excellent compromise, as it allows them to dabble in art without being gifted. 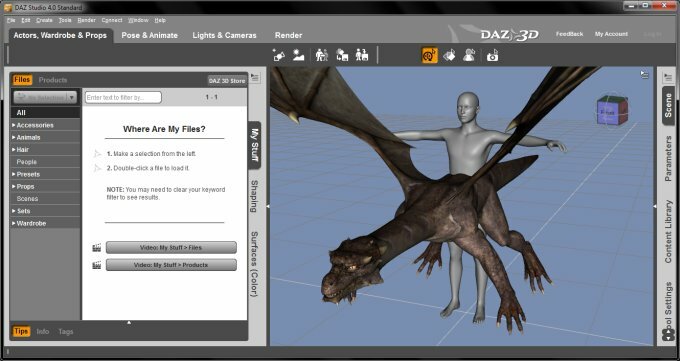 In fact, the demand for proper imagination and skills is the greatest limiting factor with all 3D programs, but it is the least so with DAZ Studio. Even so, you do need some basic skills to get going. If you can't draw even a potato on a good day, then you won't really get around with the Studio either. Once you're done with the modeling, you can then render your scenes to see what gives. 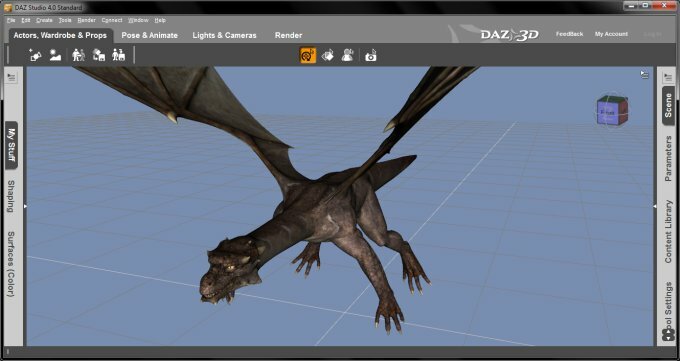 There's also a free dragon, which is mandatory in this kind of software, as nerds love dragons. Whatnot, most of the models featured on the official websites as well as elsewhere are buxom yet slim, scantily clad women, which are designed to arouse the young mostly male users and make them cash even more coin on what can only be described as visually pleasing accessories. Or as they say in French, nerde a la fappe. The free version of the program contains only limited props, a handful of dolls, some clothing, some medieval Dungeons 'n' Dragons style trinkets, one or two scenes, and little else. You will need to add new products to your software to get a more varied arsenal. The thing is, most of the additional stuff costs money. So you can treat DAZ Studio as the primer, the teaser, the aperitif, and the rest as modules you must pay for. Still, fair enough. The installation of additional formats, products, scenes, figures, and items is somewhat similar to installing new materials and libraries in Kerkythea. The big difference is that you will need to spend some cash for most of the content. DAZ Studio is not designed to replace your other software; instead, it should work alongside it. I still believe free-hand art is best done in Google SketchUp, rendering is best done in Kerkythea and POV-Ray. On the far end of the spectrum, Blender is designed for super-serious work. DAZ Studio seems best made for scenes involving people, animals and other creatures, with soft, curved surfaces. I find the software oriented toward the fantasy and sci-fi genre, with the Tomb Raider like heroines as the main motif in most of the art work. You also get fairies and monsters that feature heavily in contemporary RTS and RPG games. Not a bad thing, but there's a bit of stereotyping in how the people look and dress. And of course, young people will definitely feel perky after using the software for a while, but that's part of the charm. As someone who likes to create his own work, DAZ Studio is a bit of anti-thesis to the imaginative spirit and the hard labor of artistic creation. Then again, it allows countless millions of people with a wonky hand to produce art without having to replace their genes. DAZ Studio is a pleasant program, somewhat limited in its free form, but still good enough to let you enjoy and explore, even if you're capable of creating similar stuff yourself. But sometimes, you might be in a mood just for simple choreography. As always, there's a limit to what the program can do versus what your mind can do, so don't feel frustrated if your creations are not quite as good looking as what you see on the official website. I find DAZ Studio to be a great addition to my artistic arsenal. I only wish there were more free content, but even so, most definitely recommended. Overall grade, 8/10. That would be all for now. Stay tuned for updates and yet more lovely models. All coming soon.